Our first impressions of Princess Maeve was that she has a very regal, intelligent stature. On a very cold, snowy day, Maeve didn’t put a foot out of place during her photo shoot and quite literally posed for us! 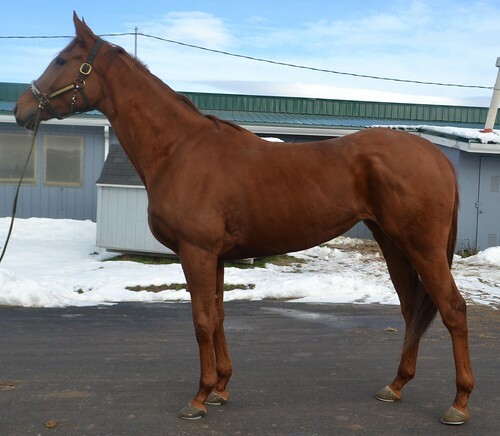 Her groom reported that Maeve is good to work with and is sensible in the barn and on the track. She reported she is not “mareish” and is just an all around good egg. 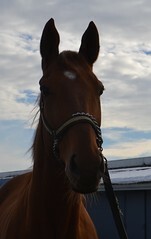 Maeve is lightly raced with only 11 starts. 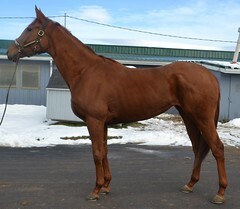 After those 11 starts, Maeve has not broken her maiden, although she has hit the board in over 50% of her starts, so her connections are ready to move her on to something she will be more successful in. Her trainer reports that she has a paralyzed flap which she has always trained and run with and shouldn’t bother her in future disciplines, especially those less strenuous than racing. 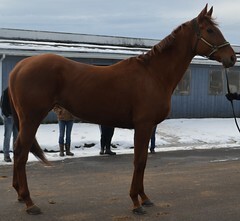 She has a nice uphill build and could foresee her being a great dressage mount. Her trainer reports she is clean legged. She is by Frost Giant (we know there are lots of Frost Giant fans out there) out of a Golden Missile mare. She is RRP eligible for 2019!